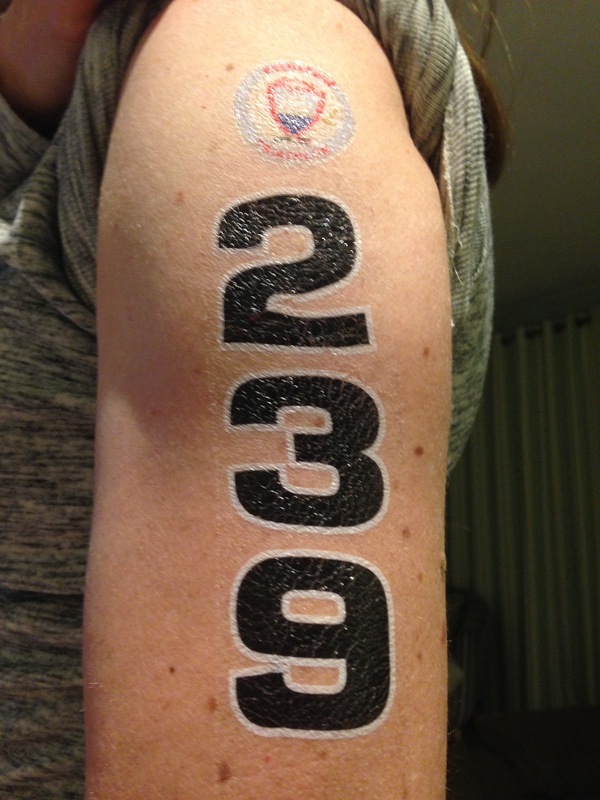 I am a triathlete! 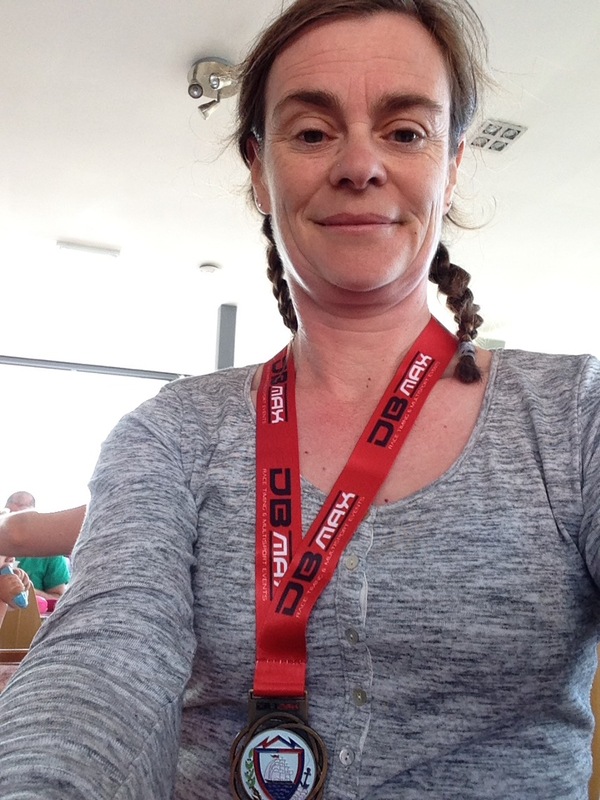 No, really I am, I completed Portishead Sprint Triathlon this morning and am still all in one piece (and still wearing my medal, truth be told). After training for my first Tri earlier this year but then having to miss it through illness I knew this was an itch that was going to have to be scratched. I needed to justify having the bike and 18 months of swimming lessons apart from anything else. 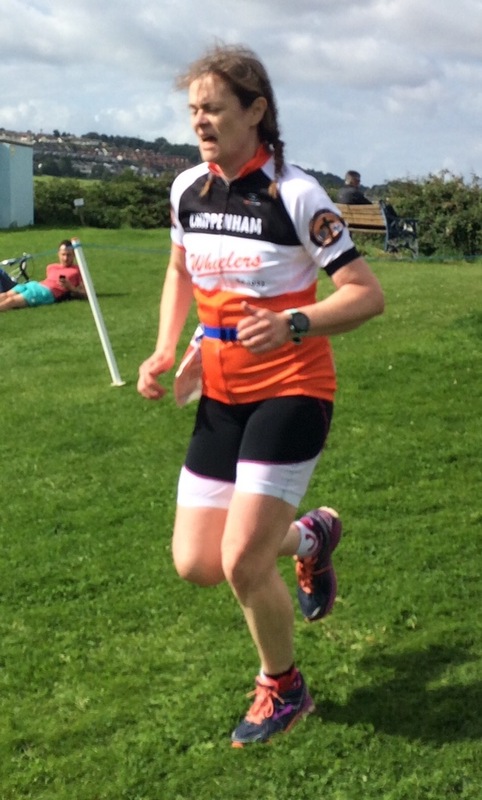 Rather than take you through a blow by blow account of the day I’ll give you some lessons as learnt by a first time triathlete. 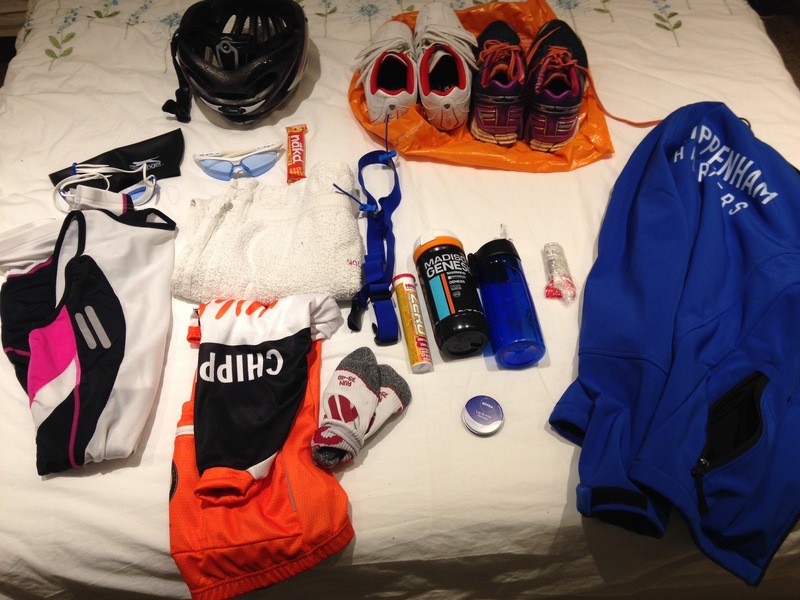 Triathlon needs serious amounts of stuff. As I was getting everything together the night before I commented that it was like packing for a fortnight away. Once you arrive at the race venue, all this stuff has to be sorted out and put in your transition area. Not just put, but laid out in the precise order you’ll need it, cycle stuff separate from running stuff, bike correctly racked (i.e. hanging precariously), helmet ready to put on BEFORE YOU EVEN TOUCH YOUR BIKE. Then you have to find the toilets. Then you have to escape from your trisuit in order to use the toilet, and then get back into it again. Leave yourself plenty of time to get poolside for your race briefing, and whatever you do, don’t at that point realise you are still wearing your non-waterproof Garmin watch which you were meant to leave with your cycling stuff. If you do, make sure you sprint really fast back UP the hill to transition, and then back down again thus arriving just as your race briefing starts already panting and out of breath. Do not get your tattoo wet until it is on the part of the body it is meant to go on. If you do, you’ll have to join the queue of similarly foolish people waiting to use the special “tattoo pen”. 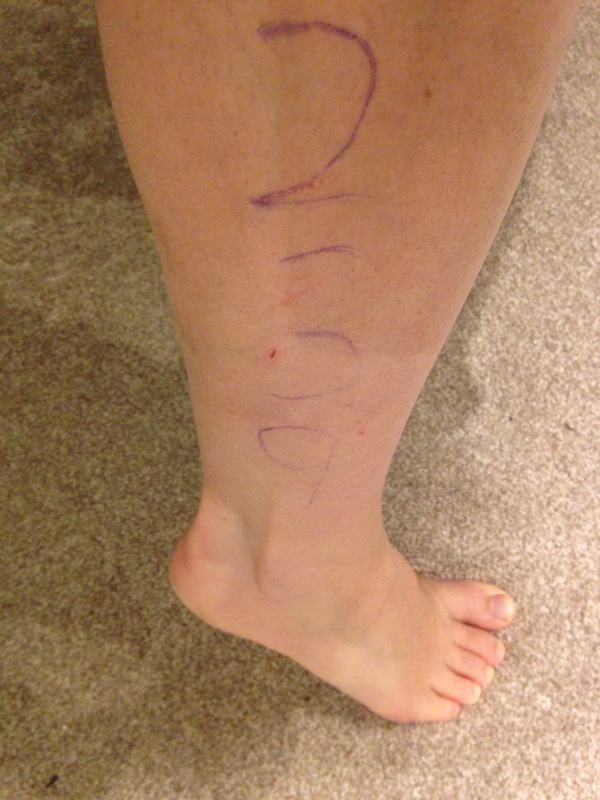 My pre-race prep included having a strange man holding my leg and writing on me, followed by me doing the same to him. How to make friends and influence people. This is seriously confusing. Each person has to start at EXACTLY the right time, which in my case was 8:44:10 am. The swim was in Portishead Lido, which is a lovely 1960’s 33m pool with 5 lanes. 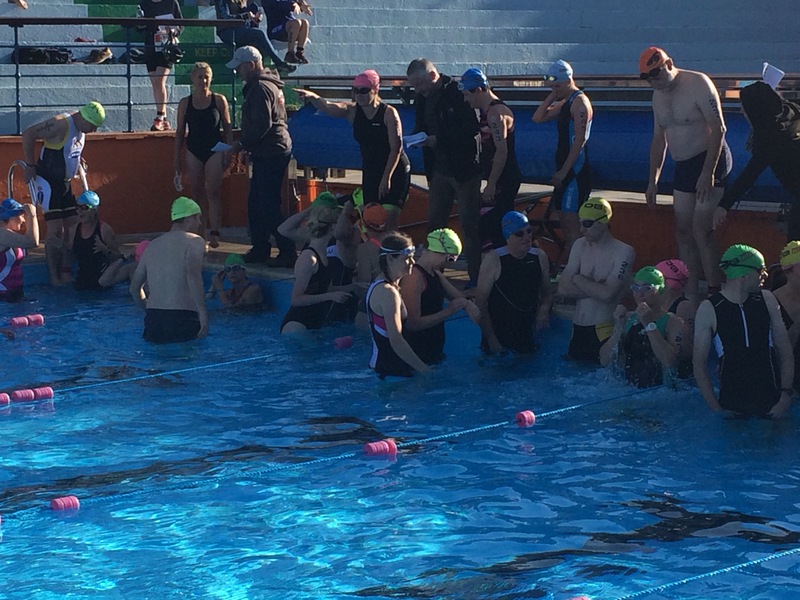 Each swim start had about 6 – 7 people in each lane, all with a different coloured hat* so they could start in the right order, 10 seconds apart. * I was special, I was “No Hat”. They ran out of colours. Do not get emotional whilst swimming, even if you often get emotional in races. It is impossible to blub and swim and breathe simultaneously. It is okay if you immediately catch up with the swimmer in front of you, who is doing slow breast stroke, meaning you also have to do slow breast stroke so you can give yourself a quick talking to. 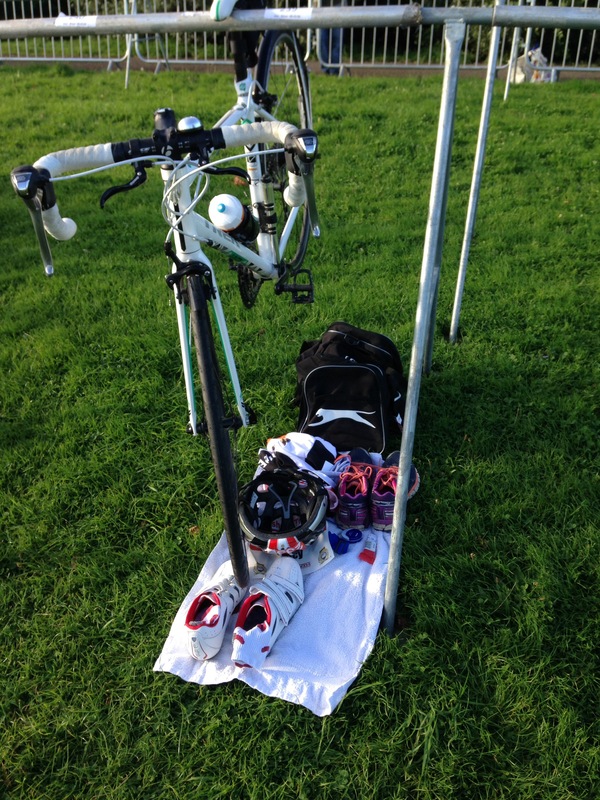 If you have laid your transition area out in an orderly fashion, and practised changing from one sport to another, then transition is a breeze and will save you minutes of time. However if you are too full of adrenaline you will end up standing in bare wet feet in the middle of a field, struggling to pull on your brand new cycling jersey with very tight arm elastic over wet arms whilst simultaneously putting on your helmet because you MUST have it on your head before you even think of touching your bike. 4 minutes and 11 seconds is a long time to faff about in transition, but as long as you finally leave with the correct stuff then its fine. Getting on a bike straight from swimming is not as soggy and awful as it sounds. I was convinced this was going to be a dreadful, cold and squelchy experience, but it wasn’t. A tri suit is designed to dry quickly, and even my Aldi bargain did this magnificently. 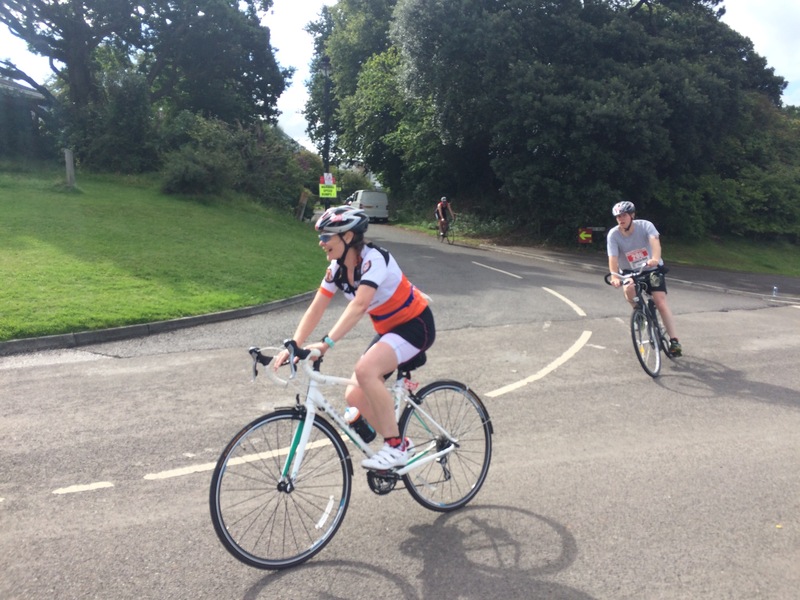 If it’s a hilly course, then practice cycling up hills. This course had 3 long hills that I only got up because I was too stubborn to stop. My legs are saying “We told you so!” each time I try to go upstairs tonight. Enjoy the downhills, smile at the photographer but if you must cry “woo hoo!” make sure no other cyclists are too close by. Your legs will feel like lead as you start running after cycling, and the conventional wisdom is to “spin” your legs before you get off the bike to minimise this. Conventional wisdom doesn’t say what to do what the final 50m of the bike course is up a short, steep hill that you have to struggle up. This changeover should be quicker – just shoes and moving your number (on your tri-belt) from back to front. I wish I’d taken my cycling jersey off, but I was trying to be quick, and I feel self-conscious in my tight fitting trisuit. There was such a huge variety of ages, shapes and sizes I really shouldn’t have worried. As soon as you’re ready, locate the “Run” exit and plod your heavy legs towards it. Feel encouraged that the other athletes around you are staggering as well. As a novice triathaloner, you will of course have researched the run course as well as the bike route. You won’t have chosen a run with a big hill in it, nor an Off Road section whose uneven surface is really hard work on tired legs. Scoffing 3 Shotbloks as you set off for energy is a good idea but be prepared to have a totally gummed together mouth afterwards (and face if I’m honest). Fortunately there was a drinks station at 1K which we passed again at 4K, although they didn’t have gin & tonic. I even offered to make it easier for them and just have gin, but no luck. Maybe next year. As you head back to the race HQ, smile at the photographer, swear at the steps and hill up to the finish line, then sob quietly at the top as you see you have to run past the finish line further up the hill and around a tree before finally heading towards the finish line. Don’t forget your sprint finish! Smile as you cross the finish line, and try not to buckle under the weight of the medal they distract you with as they remove your timing tab. Make sure you retire to the nearest cafe for post race nourishment. Medal wearing is compulsory. Remember to thank your faithful significant other who drove you to the tri, helped with your stuff, and has waited patiently to take photos of you as you head back to transition and the finish. Try not to feel emotional in the cafe as you realise you DID IT!!! – there is cake waiting to be eaten, dammit! Three races in recent weeks – it’s all or nothing here! 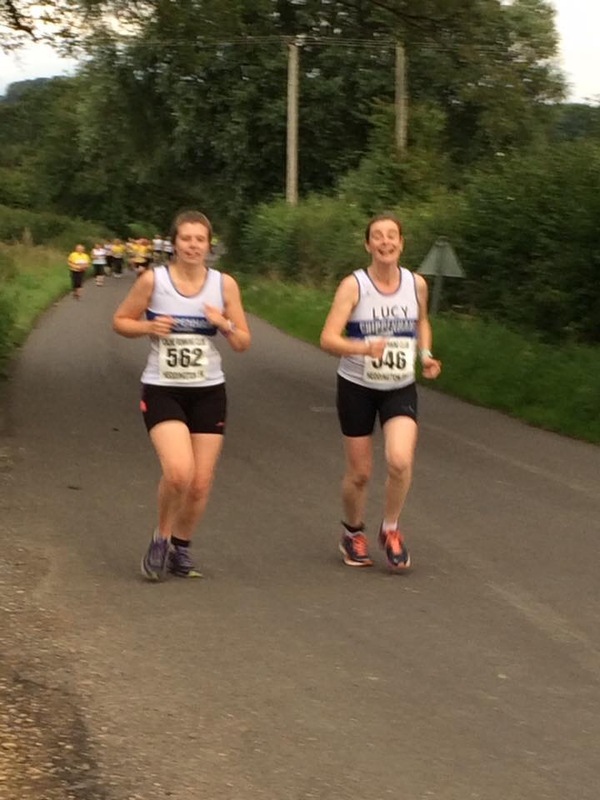 Back at the end of June I wrote about the Great Chalfield 10K, a race I’ll stagger round even if I can’t race it because it’s just such a great event. It was definitely a staggering run this year, and as I wrote in my race report a huge highlight for me was spotting a deer watching us climb the last hill. I love seeing deer, and I’ve spotted more when running than at any other time. I’m always amazed that a wild animal of such a size can live along side us, relatively invisibly. I always think if you see a deer, it means it’s a GOOD day. 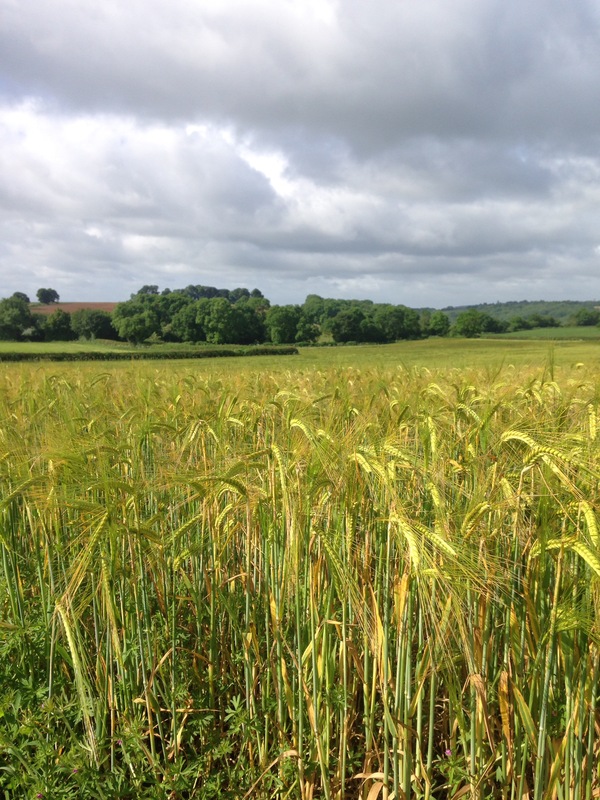 On 2nd August I ran the Stripped Back Bustard 5 (miles), and wrote about it here. On the longand soggy drive home, in a car that now resembled a sauna on wheels, I thought I saw a deer-shaped thing at the side of the road going down Bowden Hill. It wasn’t moving, so I wondered if it was a model. I slowed right down, eventually stopped, and a fallow deer leapt out and trotted across the road right in front of me. Magical. Another good day! 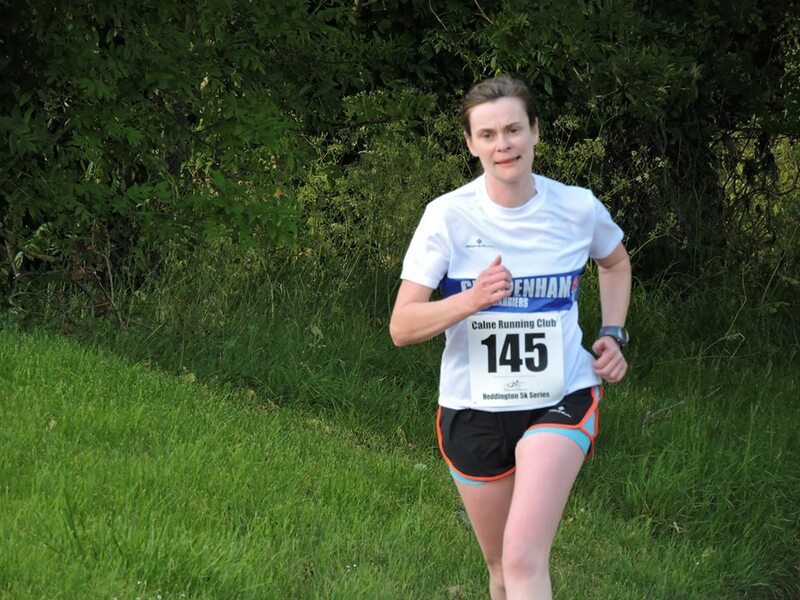 Last week, I had another race, the last in this season’s Heddington 5K series. I was idly thinking of trotting around at about 9:30 minute mile pace which would get me in under 30 minutes, when I bumped into Nikki. I ran June’s Heddington 5K with Nikki when we were very disciplined and ran at a steady 10 minute mile pace together. (Read about it here). It turned out that she was thinking of running at about 9:30 pace because she was desperate to finally go sub-30 for a 5K. Again we agreed to run together, and started near the back. The first mile was fine (it’s mostly downhill! ), the next half mile to the halfway point was still okay, we were passing a few runners and just keeping going. At 2 miles though, the chatter stopped and we were working hard to keep to our pace. At about 2 and a half miles I could sense Nikki starting to drop back slightly, so I nagged and verbally pushed her to just keep her legs moving. We made it to 3 miles. As we came to the “200 metres to go” sign we both glanced at our watches, gave an excited squeak, and Nikki pushed off on her finish line sprint (how do people do that??!) I crossed the line in 29:21 and Nikki in 29:17. She was so happy – and I’m glad its not just me who cries when they set a new PB that they’ve been wanting to hit for a long time. 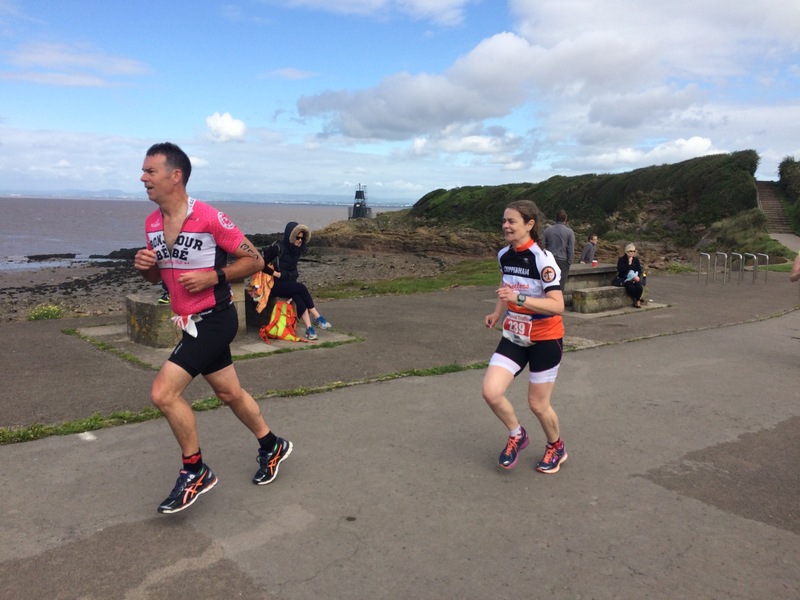 Well done Nikki – superb gritty running! I left straight after the prize giving as I’d left my son with cooking instructions and wanted to make sure he hadn’t burnt the house down. As I came back down Bowden Hill again, I thought about the deer and wondered if I’d see it again. I looked and looked, but no such luck. As I headed along the road to Corsham though, I could see something moving at the edge of the road. A cyclist with no lights? A runner ill-advisedly wearing brown at dusk? No, of course on a special day like today it had to be another deer. As I slowed down it cautiously crossed the road in front of me and disappeared through the hedge. I *knew* it had been a good day! After many weeks of coughing and sniffling, and feeling very sorry for myself (and my poor family who had to put up with me) I’m officially back in the room. I ran twice last week, only slow and steady 5K each time with walking breaks and coughing breaks and taking photo breaks. It came as a bit of a shock to discover I had entered a 5K race for last night. 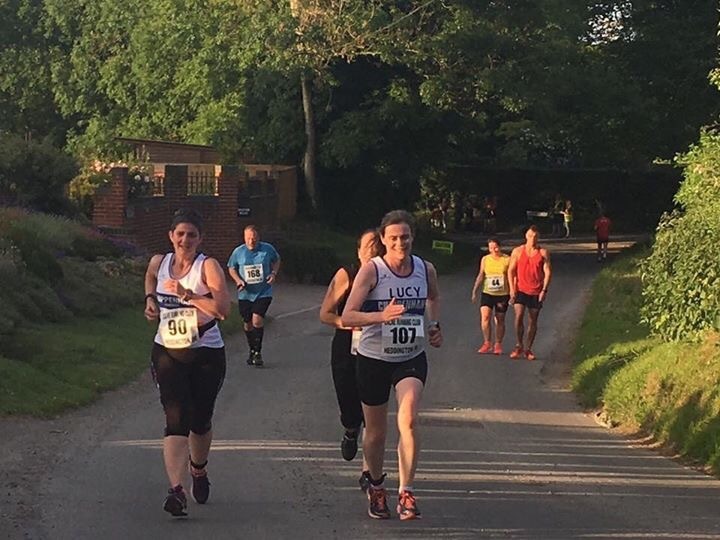 Heddington 5K is run as a series of 3 races over the summer months and sells out in a matter of hours each time. This might be because the course is overall downhill, and thus practically every runner I know has run their 5K PB at this race. I wandered over last night, and was met by the vast hordes of Chippenham Harriers who also knew about this race’s magical ability to practically guarantee a PB. With lots of chat, and catching up with running buddies I hadn’t seen for weeks, I didn’t have time to feel my usual pre-race nerves because it didn’t feel like a race. As we moved to the start line I conciously kept to the back. The race starts with a mad downhill dash which means after half a kilometre you are already regretting your pace. My simple aim last night was not for a PB, but to have a steady run, with no walking / coughing / photo stops. Ideally I was hoping to try and stick to 10 minute miles but I was flexible on pace (I.e. I had no idea what to aim for!). I found myself next to another Harrier (called Nikki) who was doing exactly the same, we fell into step at the start, and ran together the whole way right up to the point where she managed a sprint finish and I managed a finish. Heddington 5K. Photo by Rachel Beek. I was very pleased with my 31:04 time, which looks pretty much like spot on 10 minute miles to me, and with the fact I didn’t have to walk! Well done Calne Running Club for such a brilliant race, and especially for the chocolate at the end! Posted on 14/06/2017 14/06/2017 Categories 5K, Race reportsTags Calne Running Club, Heddington 5KLeave a comment on I’m back! After my stunning ** race last week, where I had a goal pace which I managed to stick to (below 9:30 minute miles) and even managed a sprint finish, AND felt strong going up the hill, I decided this morning was the day to try and chip away at this year’s parkrun times. My parkrun PB is 25:52, which sounds a pie*** in the sky target at the moment and actually dates from May 2015, but if I can keep on chipping away at this year’s times who knows how close I’ll get. Current parkrun times have been around the 29 – 30 minute mark, but with my recent race times I thought SURELY I could run faster than that? Yes the course has been muddy, yes I’ve been doing a lot of chatting, but come on Lucy! In February I finally managed to get a time under 30 minutes again. Two seconds under, but hey it all counts. 3 weeks ago, I hauled myself under 29 minutes. Three seconds under, but again, who’s counting (apart from the timekeepers and my Garmin). Last night I calculated that if I ran under 9 minutes per mile I should be able to scrape in under 28 minutes. Anything’s possible the night before parkrun! This morning I told my friend Valerie about my plan, and she immediately said she’d run with me as she’d also love to dip under 28 minutes again. With the pride of the VW50-54 age group resting on our shoulders, we sprinted off from the start with the best of them. Continually glancing at my pace meant I consciously overtook people when I would usually just drop in behind them (it feels like pushing in – I’m much too British to enjoy this). Valerie stuck with me, and we even picked up her husband on the way round. Ignore all tales that this meant we forced Valerie down the middle of the path and through the splashy puddles. It was unintentional, but she definitely had the muddiest legs at the end. As we made it to the straight that leads to the finish, Valerie told me that she was done, and to push on without her. I gasped “okay” and proceeded to overtake another couple of runners. Being so British, and disliking people who actually manage a sprint finish (despite last week’s effort), I shouted “sorry!” as I ran past. One of them said “You look like you’ve got plenty left in the tank. Go for it!” which has to be one of the most pleasing things anyone has ever said to me when I’m running. I was overtaken just before the line by a small child, who was being accompanied and coached by a lovely young man called Luke****. The encouragement Luke was giving him was marvellous to hear, particularly as Luke is an amazing runner who was going much more slowly than he usually would in order to pace the boy. I was trying to use some of his advice myself, but as they charged past me I felt like applauding them both! This was heart-warming, parkrun at its best, stuff. I finally crossed the line in 27:45, with Valerie only 7 seconds behind me, as 1st and 2nd in our age group. Yay – go us! Although I was tired at the end, I was in no way completely shattered. As the nice man said, I think I did have something left in my tank after all. Just maybe this running lark just needs some confidence in your own abilities, as well as training, practise, good shoes and fab running partners (not much to ask for, really). I was wondering what to aim for next, and then I remembered that next week is a “naked” parkrun (??!!!!!) where you have to predict what time you’ll finish in, and then run technologically naked (i.e. no Garmin!) to see who can finish closest to their predicted time. That could be very interesting! 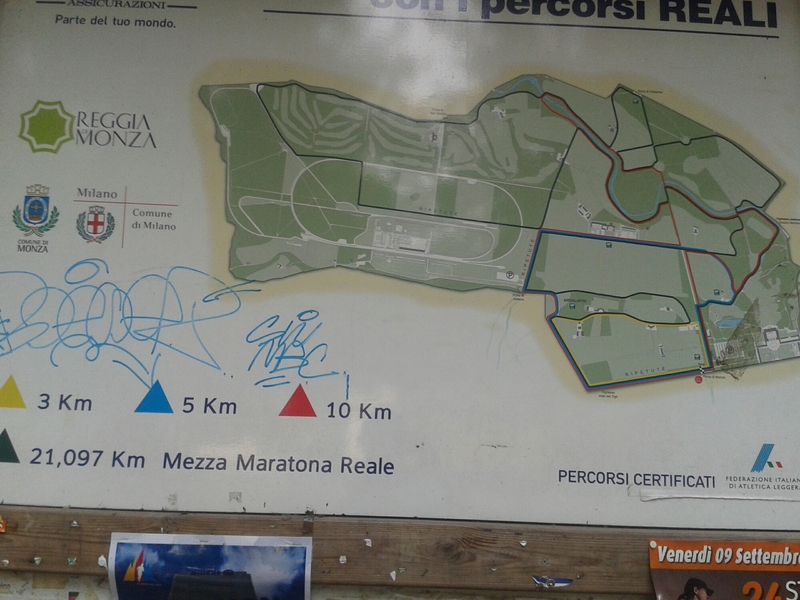 Thought I’d better try a run, seeing as the apartment is only a kilometre from the amazing Parco Reale (Royal Park). 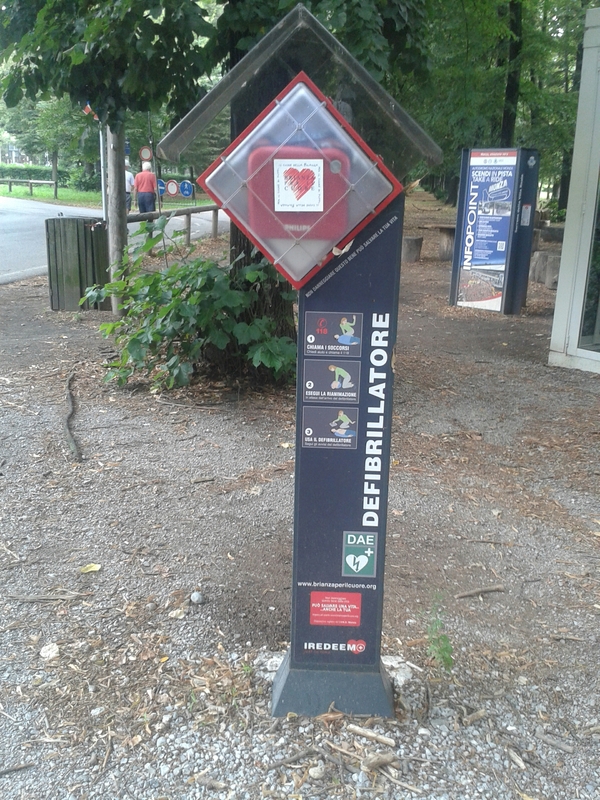 This park is so huge it contains within it the famous Monza motor racing circuit (you know, the one that hosts the Italian Formula 1 Grand Prix race. That little place). 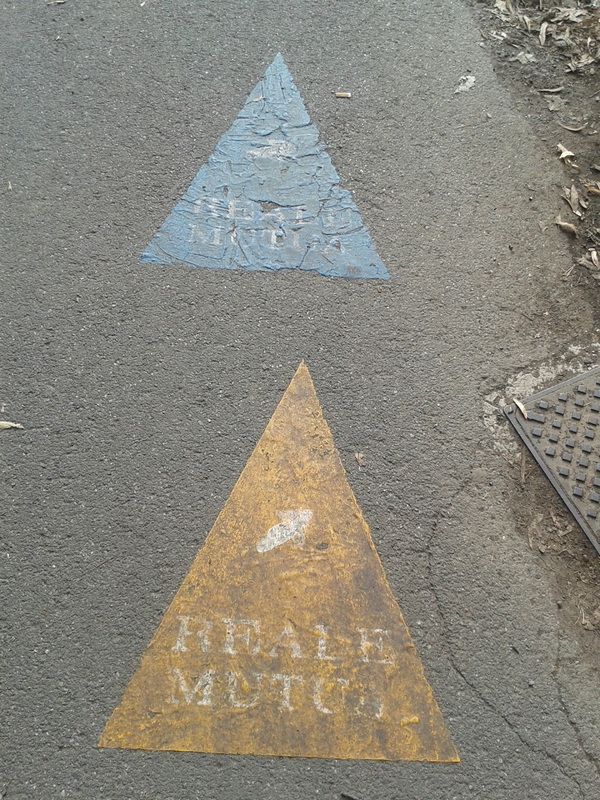 The park has marked 3Km, 5Km, 10Km and half marathon routes, making it easy to find your way around. 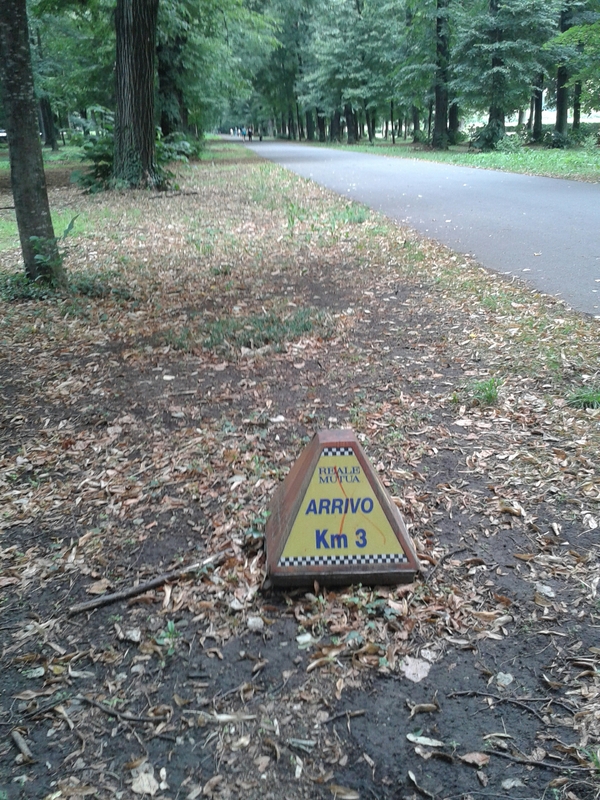 I ran up to the park, past some curious looks from locals, and then followed the 3Km yellow markers. 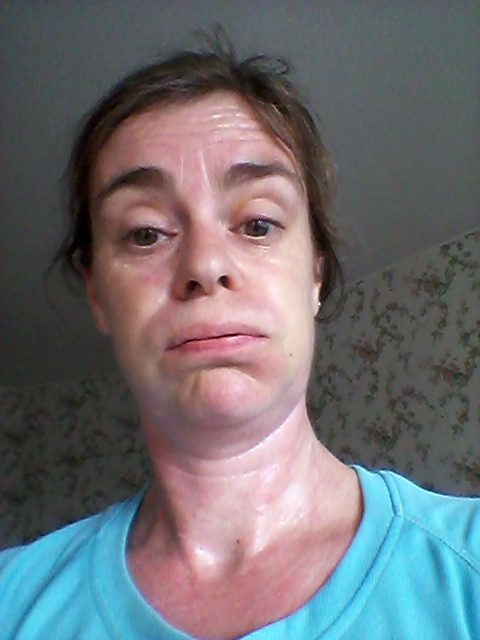 With the run to and from the park this made around a 5Km run – quite enough in this heat! There were plenty of runners in the park. Also power walkers, cyclists, mums with prams, but no inline skates today. It was well marked, it was hot, and all too soon, but very gratefully, I saw the finish marker. So I was intending to go to parkrun. I really was. But a brilliant meal out with my best friends that ended quite late put paid to that. I want to bed thinking “I’ll see what time I wake up…” and promptly woke up at ten to nine. To give me some credit, I did feel guilty about it, so a little later I decided to do a delayed parkrun. This was over my own route, it had no marshals, I could happily forget my bar code, it wasn’t in a park but it WAS 5K. It’s down and back a small lane that can be busy during the week but I reckoned would be safe on a Saturday. As I set off, true to parkrun form I briefly thought I should have had a warm up, then I carried on anyway. I also suddenly remembered that last Juneathon I ran this route at the start and end to see if I could improve my time. It was really hot and muggy and I remembered using that excuse last Juneathon on this route as well. The route has an enormous dip that you run down and up twice, once in each direction (I always use this as an excuse on this route – even when I’m on my bike). Anyway I stopped my Garmin at 3.11 miles and dripped the remaining short distance home. I was so sticky I am sure I left a slug trail behind me. Attractive. Go me! Looks like the “Killer Tuesday” sessions (as we affectionately call the club “Efforts” evening) are working. Whenever my brother visits from the North (land of pies) he always comments on how many more uncomfortably large people he sees here in Wiltshire compared with at home. I’ve lived here for too long to notice either way, but I think I might have found the reason why. My brother was popping over today with my Mum and Dad for a quick cup of tea, and I realised I didn’t have any cake or nice biscuits to offer. Fortunately our local pub has the loveliest owners and they happily agreed to package me up what was basically a takeaway cream tea. They even popped the scones into the oven so they were warm and included cartons of jam and cream. These were delicious, but what was amazing was the scones were as big as my head. * I’m thinking maybe this explains the size of people in Wiltshire?! After such an enormous elevenses I couldn’t manage my lunch until about 4pm, but this was perfect pre-race food timing so actually worked out very well. I then headed out to the first in this year’s series of the Heddington 5K races. These races are quite informal, you can only enter on the night, you park and finish opposite a pub, they have chip timing and only £3. Last night was full of club runners because it’s basically a downhill, PB course. At one time this would have been intimidating, but for the first time ever I too was a club runner, proudly sporting my (borrowed) Chippenham Harriers shirt. 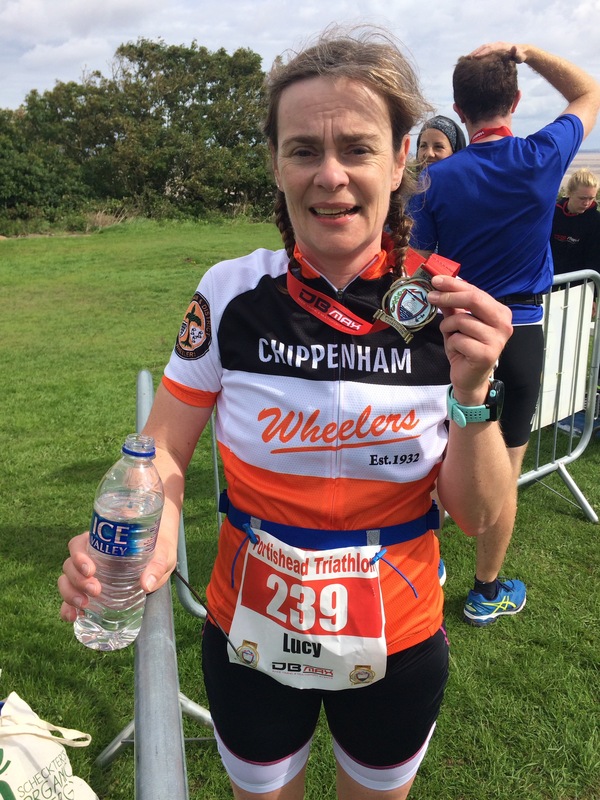 ** It was so different to my usual race experiences to be with a big group of people, and to have lots of runners to chat to both before and after the race. *** It was also a novelty to hear people shout “go Chippenham!” and realise they were shouting at me! A scary downhill charge of a start**** led to a fast race and a new 5k PB of 25:27. There are two more races in this series so with a warm up, and less wind on the night, my goal of going sub-25 looks like it could be achievable. I think eating a pre-race scone-as-big-as-my-head is going on my list of ideal race prep as this was obviously what made the difference. Whilst I’m talking about weight, a top tip. 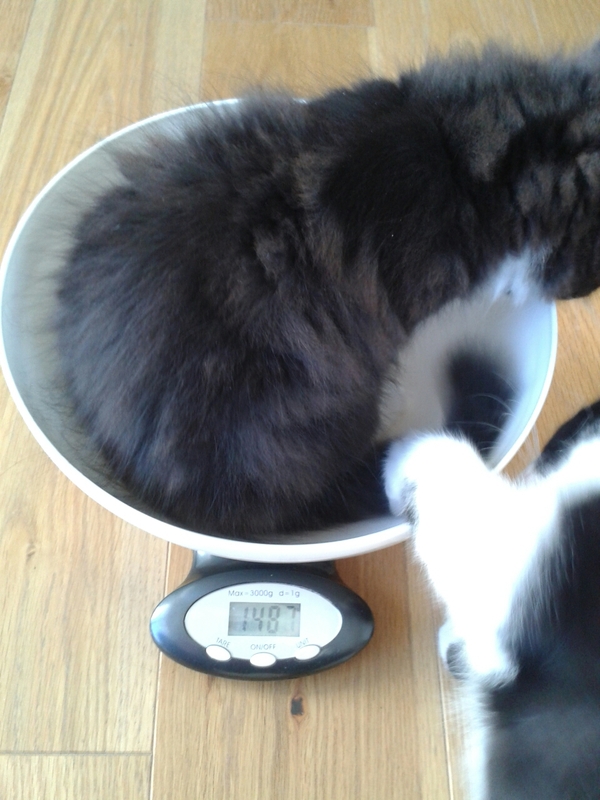 If you have any concerns about your own size, hide them by making your brother look like he’s heavier than he actually is by ‘helping’ with the scale. *There is no photographic evidence of this because I didn’t want to let the scones go cold. **Thank you for the loan of the shirt, Lucy! It’s Saturday so it must be parkrun day, yes? Erm, actually I had told a friend I probably wouldn’t make it to parkrun as I was thinking of having a lie in. However Juneathon laughs in the face of lying in, and I was wide awake at 8am. What’s a girl to do, but to get up and parkrunning. So 5k done and back home in time for second breakfast. Juneathon lives (as does the smug feeling) which lasts most of the day). 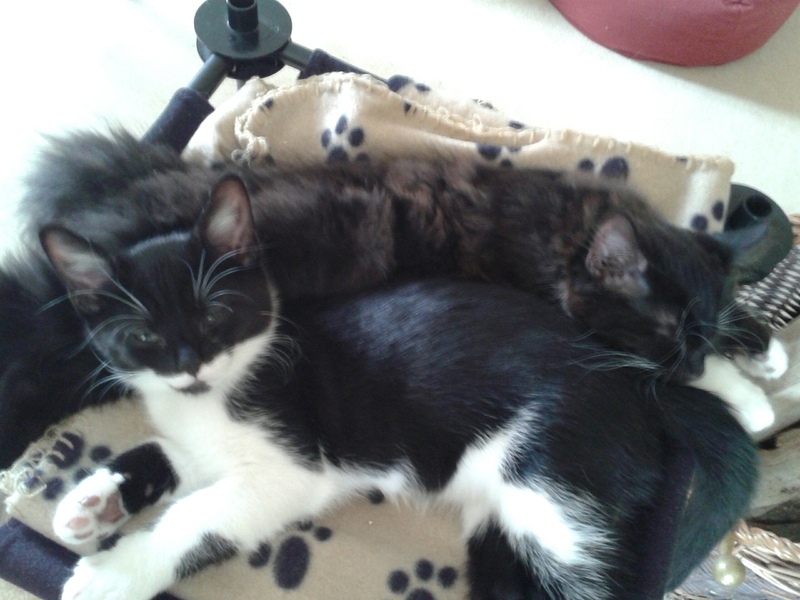 Today’s Kitten News. 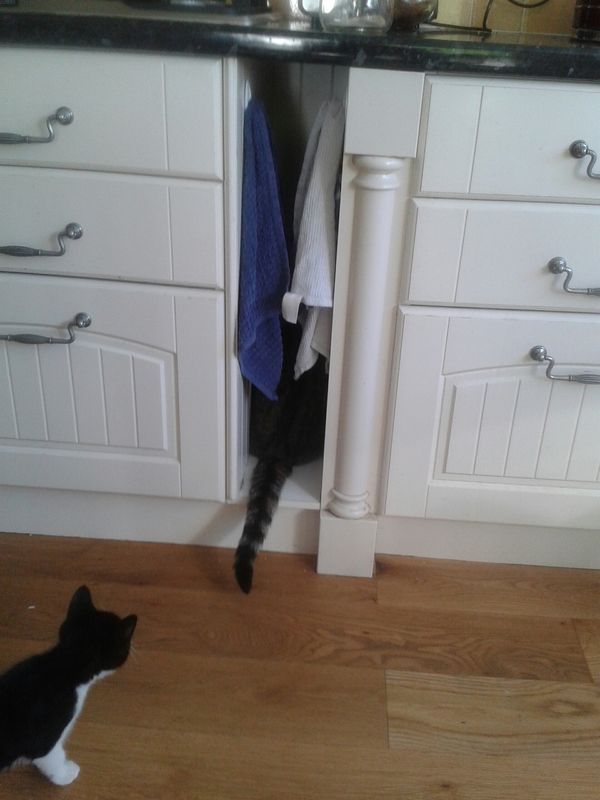 Big cat has been trying to hide. Unsuccessfully. 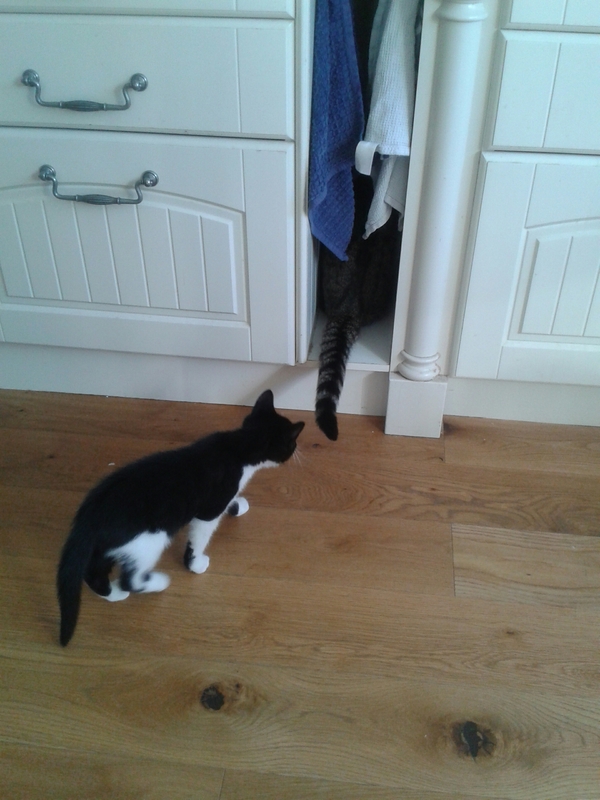 You really don’t want to see what happened shortly after this second photo, but I can promise no kittens were harmed. Just a little bit biffed.